First impressions. The subtle, vital but often over-looked human gateway to achieving corporate objectives such as long-term customer relationships and profitable lifetime value. For many, the starting point for mapping customer journeys conveniently begins at the first ‘touchpoint’; the call centre or website visit where funnily enough, processes also start. The very language suggests a physical contact has to be the trigger and yet getting to that point is highly likely to be the consequence of what a customer has seen or heard in the past from others’ experiences. Malcolm Gladwell’s book “Blink – the power of thinking without thinking” is a rich seam of though-provoking insight into which any self-respecting decision-maker and leader should tap. It articulates the world of instinctive reactions; the crucial sub-conscious responses we make every day yet we are unable to explain how we do it. What does it mean for improving customer experiences? 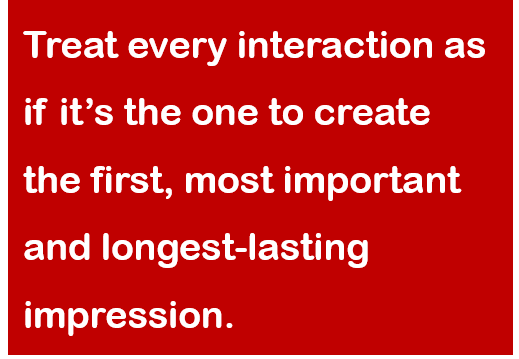 I’d say it’s about upping the ante before competitors do; treat every interaction as if it’s the one that creates the first, the most important and longest lasting impression. Organisations strive to build lasting and profitable relationships by investing finite budget in retention activity, loyalty rewards and referrals. But it is that gut instinct, that very subjective and emotive feeling created in a flash of a chemical impulse that shapes the memory to which the rational side of the brain will turn next time there is business to be done. Take, for example, Twitter. Yesterday, a Marketing agency I followed published a tweet pouring scorn on a family-favourite TV chef. No reason, just “We’ve never liked him”. My reaction, deciding to unfollow, was over before I’d realised it. Tap and gone. I’d given it no conscious thought; in hindsight there was just something about it that wasn’t professional and in today’s world that’s simply not tolerable. No company in its right mind would set out to show a customer contempt, the consequences being all too obvious. However, that is exactly what happens when customer experiences are left unchecked, processes take priority over people and metrics matter the most. To précis the research from Malcolm Gladwell’s book, a large study of conversations between married couples was undertaken in order to try and predict the likelihood of the relationship surviving. The most striking common denominator among those that ended in divorce was the presence of contempt, whether unintended or not. This again shows the need to keep a focus on the little, subtle things, without which the ‘WoW’ factors are a “Waste of Work”. Contempt is something that’s felt and attacks the very core of our own values. Whether it’s unintended or not, whether those in the Board room know it or not, if I pay for a meal at a decent restaurant and the waiter shows no sign of thanks or even eye contact, that to me might be a sign of contempt. Note to self: not going there again. I might treat myself and pay extra for a first-class rail ticket. But when there’s standing room only or no wi-fi, my note to self says: drive the car next time. I order an item online accepting that it’s “due in stock by the end of the month”, only to find that it never was due and there’s no knowing when it will be in, yet my money is paid. Note to self: get a refund and never go back there. If we are serious about developing long-term relationships, then the conversations around the Board table need to be every bit about how we make our customers feel as about what we do. Because if we don’t, in the time it takes to blink our customer will be gone.